It seems like everyone has that one special summer, that point that marks the separation between the carefree days of childhood and the burdens of adulthood. It’s a common experience—which is why it makes such a rich setting for any coming of age story. For Kyle Edwards, that summer will be infused with terror, violence, and the end of all innocence. It’s 1976 and the Edwards family lives at the end of a long dirt road in rural Georgia. One day, young Kyle is riding his bike down the road when a fast moving car swerves to miss him. Looking back, he sees a bloodied woman emerge from the wreckage and start to make her way towards him, asking for help. Panicked, he rides as fast as he can toward home and says nothing about the accident he caused. When no evidence of the incident is found, Kyle, in the classic manner of children with other things to do, puts the “reticulated woman” out of his head. Meanwhile, as their parents’ marriage quietly falls apart, Kyle forms a bond with his younger sister, Grace, against the bullying of their older siblings and the crueler depredations of another band of teenagers. This bond is soon tested—and manipulated—by Kenny Ahearn, the “paralyzed man” who lives down the road and has a backyard full of secrets, a strange new pet in his attic, and a heart blacker than anything Kyle or Grace have ever imagined. Jerkins (“A Very Simple Crime”) creates a beautifully suspenseful story filled with dread, cruelty, and—most of all—power. Kenny Ahearn is one of the most unspeakably evil creatures encountered in print in some time. His diabolical ability to control Kyle and draw him into his blood-soaked web is truly inspired—and, above all, chilling. The writing is top-notch; Jerkins’ prose is lyrical, evocative, and layered. The picturesque setting—a long, lonely road through wide, open spaces—serves as the perfect contrast to the stifling, closed-in terror that Ahearn represents. Further, as Kyle is drawn into the Paralyzed Man’s clutches, the boy’s emotional world turns in on itself, which serves to increase the novel’s already high levels of suspense and icy despair. 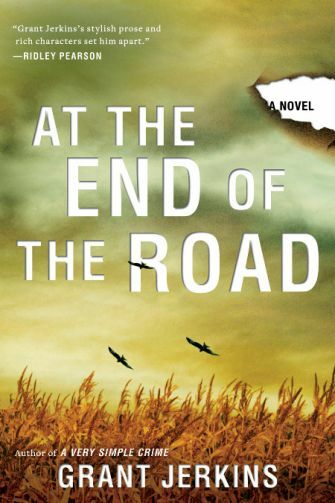 At the End of the Road is a completely gripping, bone-chillingly disturbing, read. Highly recommended.